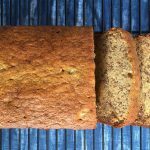 This recipe for banana bread has been in my family for over 100 years. It originated with my great, great-grandmother, Grammy O’Brien and for 5 generations it was passed down from mother to daughter. 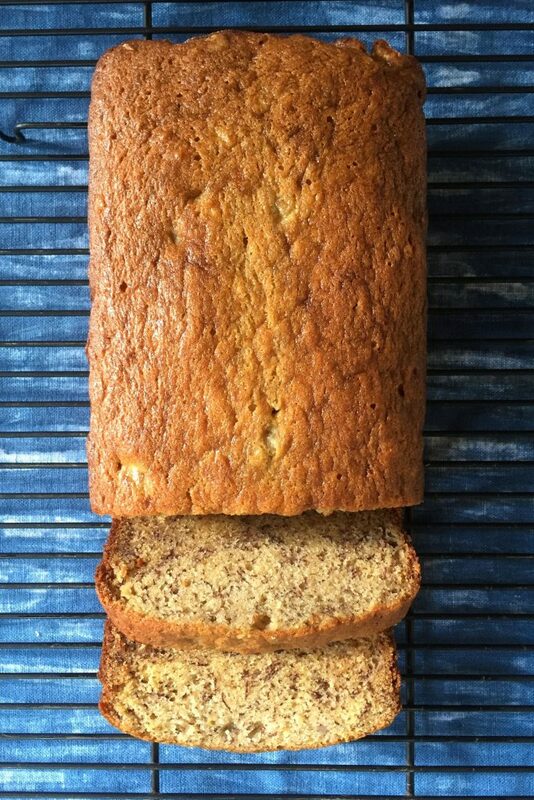 When my own daughters were just little girls, we would make this banana bread together on Sunday afternoons. So now we are up to 6 generations. I have been told that Grammy O’Brien was a smart woman, born way ahead of her time. Today she would have gone to college and excelled in any field she chose. But in her day, that was not an easy option for woman. So she married young and raised her children and her grandchildren as well. Lucky for them, she was an excellent cook and lucky for us, her banana bread recipe lives on. The truth of it is, that I do not bake with this recipe for banana bread because it is an old family recipe. 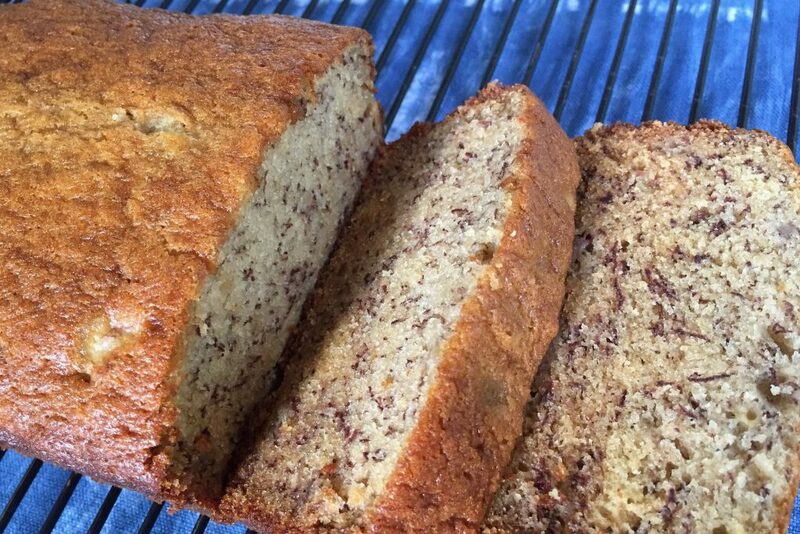 I make this recipe because it makes the best darn banana bread out there. I can’t tell you how many times I have had other people’s banana bread and think how it doesn’t even come close to mine. I know I am sounding like a banana bread snob but I cannot not help it. 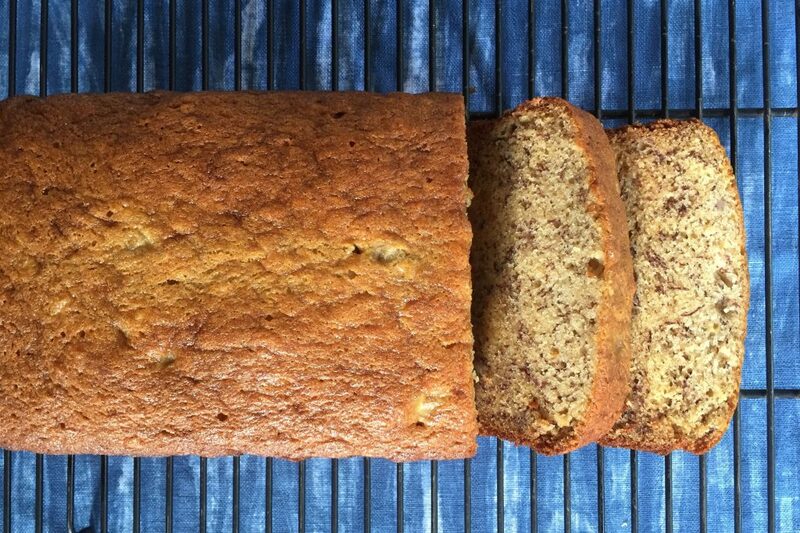 This recipe makes the most moist, buttery, flavorful banana bread you have ever tasted. And it is so quick and easy. Apparently Grammy O’Brien didn’t have a lot of time to fuss around in the kitchen because this recipe comes together in minutes. It took me only 10 minutes to get the banana bread you see in the picture, into the oven. The biggest advise I can give you, if you decide to make this recipe is to use very ripe bananas. I’m talking bananas with big brown spots and starting to turn black. I’m talking, you are thinking of throwing the bananas away. When I see 2 or 3 bananas in the fruit bowl looking like this, my first thought is that it is time to make banana bread. A couple of disclaimers. One, I added a pinch of salt to the original recipe. You really don’t have to and I made it for years without the salt. I add it because I know that a little salt in baked goods brings out even more flavor. The second thing is……well sometimes I add in chocolate chips. Now this is VERY controversial in my family. There are those (my mother) that strongly object to changing the recipe in any way. It seems the idea of adding chocolate chips not only goes against tradition but interferes with the simplicity of this most perfect recipe. I promise you that the banana bread will be quite good with or without the chocolate chips. Prepare an 8" x 4" loaf pan (approximate size). Lightly butter and then line the pan with a large piece of parchment paper. Peel the bananas and place in a medium size bowl. Mash the bananas with the back of a fork until creamy. Set aside. Beat in the eggs until well incorporated. Add in the dry ingredients and mix on low-speed until just combined. Fold in the mashed bananas until evenly combined. You may see some banana lumps which is fine. Pour the banana batter into the prepared loaf pan and bake for 50 to 60 minutes. Test with a toothpick. It should come out with a few moist crumbs. Cool on a baking rack and then lift out the banana bread from the pan using the parchment paper as handles. Enjoy warm with butter, cream cheese or simply as it is. If you decide to add the chocolate chips, mix them in at the end, then pour the batter into the pan. In this recipe, the wet ingredients of mashed up bananas is added in after the dry ingredients. Usually it is the other way around. You can add in the bananas before the flour mixture if you want, but I do it the way Grammy O'Brien wrote the recipe. Why tamper with perfection? As you can see there is no exact amount of banana to add to the recipe. When I have those really long bananas, I just use 2 but I usually use 3 of the regular size ones. The texture of the bread will change slightly with more or less banana but try not to worry about it. It's all good.